Klimis Klimentidis was perhaps the earliest business owner to be labeled eco-friendly. And with good reason. In 1968, he created a company in Kalamata, Greece, that produces non-toxic lime fertilizer for farming. But the factory wasn’t the main reason he earned a green star. 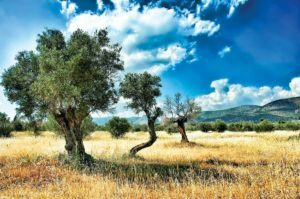 Living in a region surrounded by magnificent olive groves, he was inspired to do all he could to help preserve the environment. So he pondered ways to remove the residue from his plant without spoiling Mother Nature. After lengthy research and experimentation, he found a way to convert the burnt olive pomace wood left behind in his kilns into an alternative fuel source usable for barbecue-style cooking. First fashioned in 1992, the flammable olive pit bricks he hewed – known in Greece as “pirinokarvouno” – soon reached the kitchens of local residents as well as open stove/grill restaurants in Japan and Scandinavia. Like wildfire, they made their way to Corinth, Crete, Santorini, Attiki, the Netherlands and, finally, the United States, specifically, Boca Raton, Florida, to a dining spot named Oliv Pit Athenian Grille. Using olive pomace wood ― a sustainable, efficient, renewable product ― was the key to the successful reclamation process. 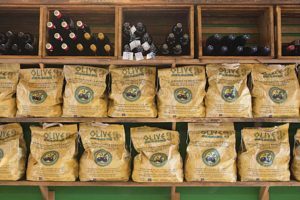 Klimentidis was able to recover the waste, recycle it and carve out a new business by marketing the product as Olive Briq. 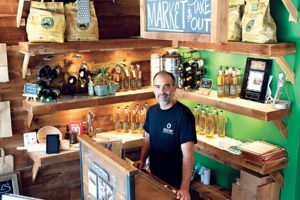 “This restaurant is the first in the United States to cook with briquettes made from olive pits,” said Marcos Alexandridis, its co-owner, a Greek native and former soccer player raised in Canada. He spent years traveling the world procuring recipes that have become the Oliv Pit’s tasty dishes, embellished by Mediterranean-inspired chefs. 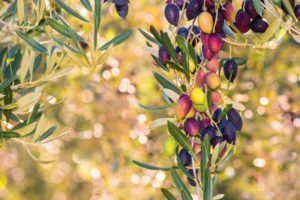 The reworked olive pits not only keep the planet’s carbon footprint in check, but produce 30 percent less carbon monoxide than wood charcoal. Alexandridis is the sole distributor in South Florida of Olive Briq brand briquettes. Europe has long celebrated the experience of dining on chicken, fish, lamb and shellfish cooked over the flame of olive pit blocks. Marcos said the light smoke “brings out the flavor of food” without overpowering it with barbecue intensity. Oliv Briq is just arriving in the U.S. after finally reaching North America in 2016. It is popular in Canada, where outdoor grilling predominates throughout the year. “I particularly like to cook meats ‘low and slow,’ and Olive Briq makes that easy,” said Craig Wakefield, a Canadian chef and barbecue enthusiast. Officially opened in January 2018 at 6006 SW 18th St., Boca Raton, Oliv Pit seats 84 in long rows of four-person tables. Owners Marcos Alexandridis and Emmanuel Vlahos have fashioned an extensive menu teeming with appetizers, Greek specialties, salads and desserts. “These recipes have been passed down to me from my Athenian family and they go back many generations,” Alexandridis said. The menu at Oliv Pit comprises a variety of dishes that profit deliciously from Olive Briq grilling: Skewers (pork, chicken, veggie), alone or in a wrap; gyro (beef or lamb) with pita, or a lamb burger. Entrees embrace fish cooked whole; lamb chops, jumbo head-on prawns and a seafood platter. You’ll also find zucchini croquettes (kolokithokeftedes), spinach pie, meatballs (keftedes), fava (Greek hummus) and triokafteri (spicy cheese) spread, and lots and lots of Calamari. For the finale, try orange or walnut cake, baklava or Greek yogurt. 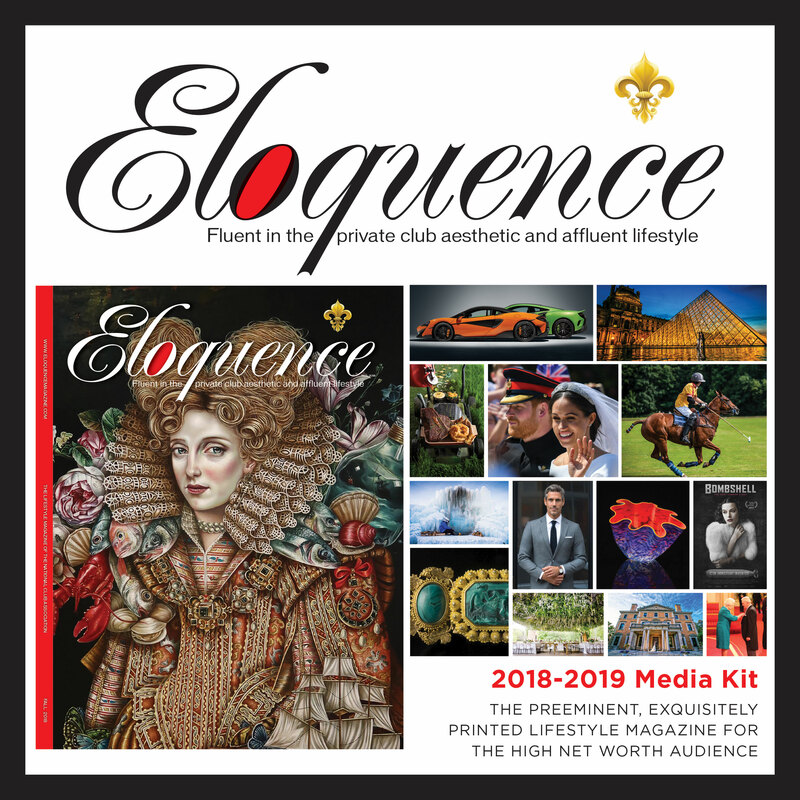 Eloquence Magazine is fluent in the private club aesthetic and affluent lifestyle, delivering bespoke content on topics of interest, such as golf and sporting, tennis, yachting, food and drink, travel, arts and culture, philanthropy, and history. Powered by CYB Marketing Solutions © 2018 Eloquence Magazine - All rights reserved.